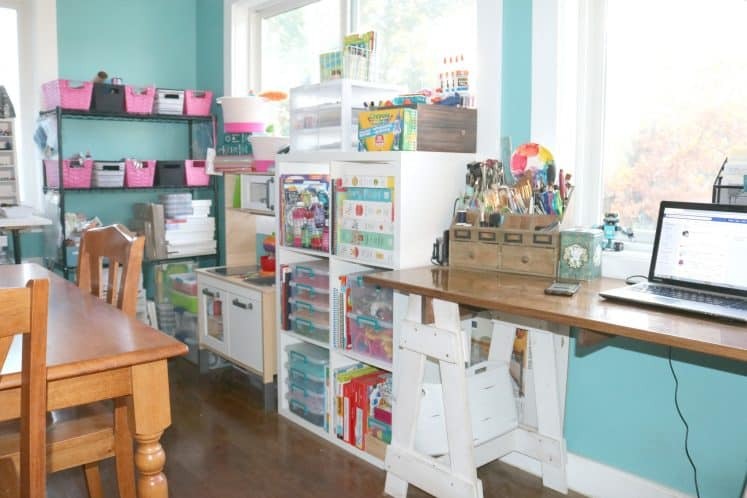 Get your creative space organized once and for all! 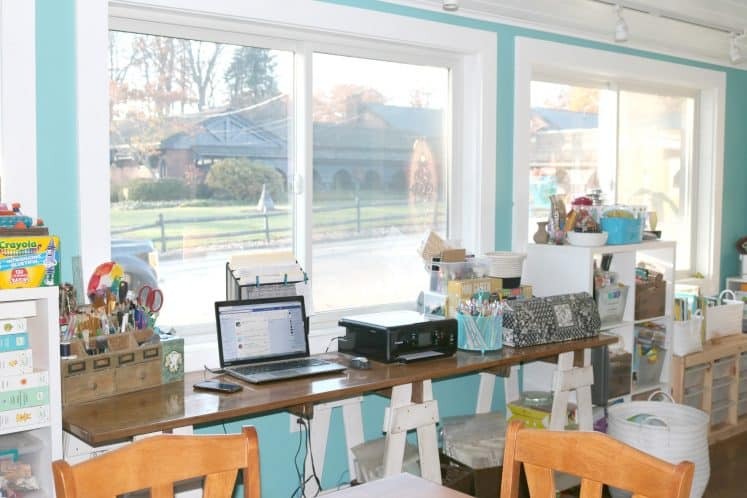 Check out the 52 Weeks to an Organized Workspace challenge and/or Creative Space Bootcamp. Happy organizing! Thanks for visiting! If you’re interested in following along with what we’re up to each week, definitely sign up via email and/or follow The Keeper of the Memories on Facebook and Pinterest. And of course don’t forget to join the 52 Weeks Facebook group for lots of insight + inspiration. Every year, I share updated pictures of the studio and the transformation has definitely been amazing. 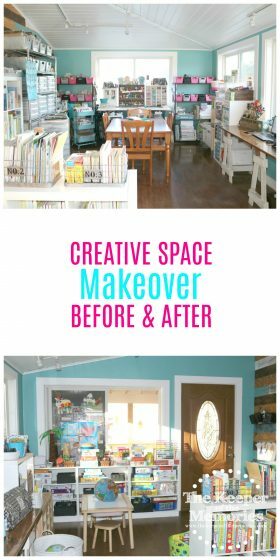 We went from an entirely empty room a few years ago to a truly unique creative space + learning place that we’re all head over heels in love with. The studio is where we spend the overwhelming majority of our time. You know, between being a work-at-home, homeschooling mama and making stuff on pretty much a daily basis. Yep! More often than not, this is where you’ll find us. Of course as our family has grown and changed, so has the amount and type of stuff that’s in here. 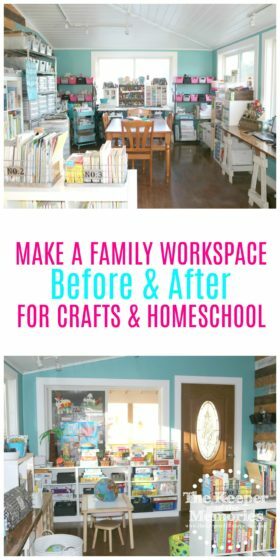 We went from craft room and play space to home office and learning place. 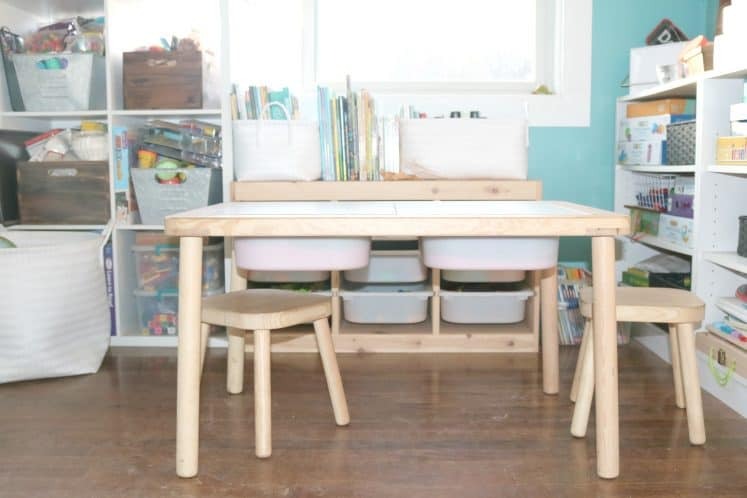 When we originally broke ground on this project, I had absolutely no way of knowing that I’d be working from home or that we’d be homeschooling the little guy or even that we would end up pregnant with baby girl. It’s amazing how God answers prayers, isn’t it? If you haven’t already, you can check out what the studio looked like before here. Otherwise, here’s a look at our creative space + learning place after working through Creative Space Bootcamp. My stuff hasn’t really changed much. I’ve reorganized the individual baskets a bit and switched out a few, but otherwise everything’s pretty much still the same. 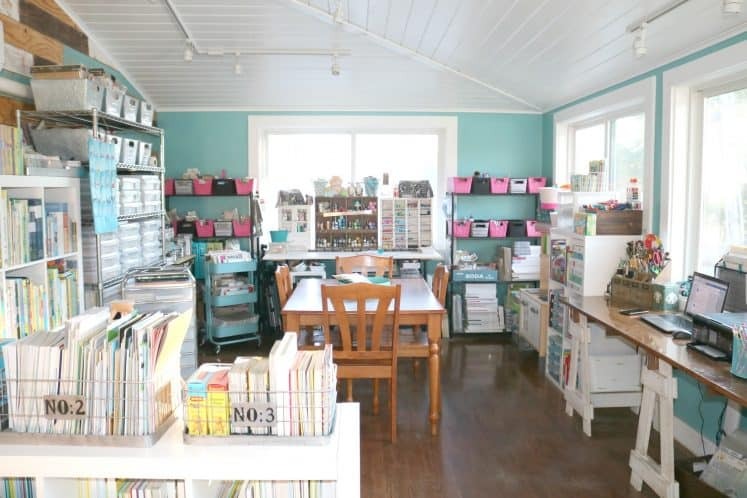 The baskets on the left are scrapbooking supplies, things like embellishments, adhesives, etc. 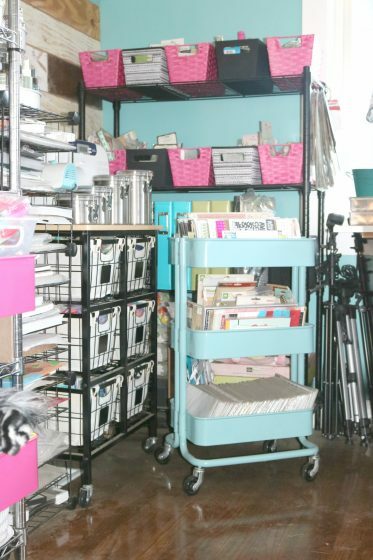 The Ikea Raskog cart is where I store all of my Thickers and letter stickers and the industrial wire rolling cart is overflowing with sewing + quilting stuff. This is my main workspace. 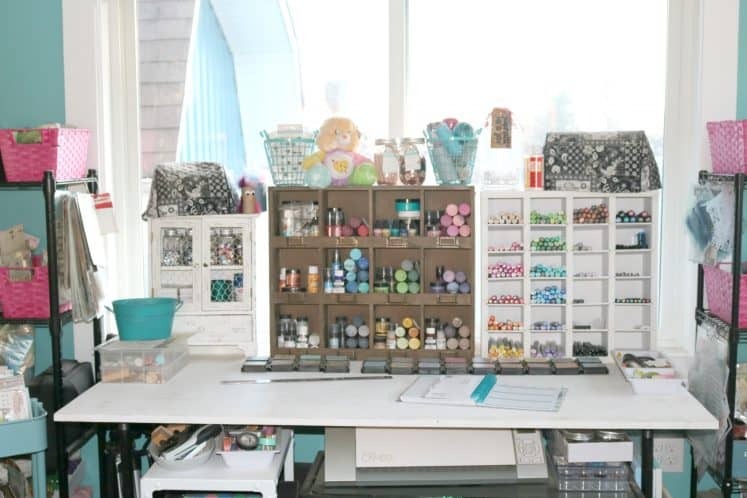 You can see how I organize all of my paints, inks, and markers along with bible journaling supplies, which are on the white cart that’s pushed underneath. 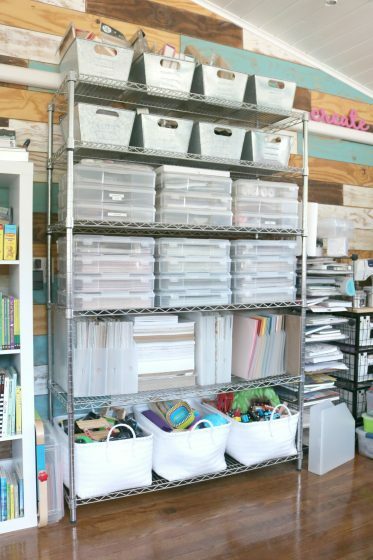 These baskets are home to mixed media + art journaling supplies, stamps, and Project Life kits. All of my patterned paper and solid cardstock are in Iris cases on this wire rack along with mini albums and chipboard in the galvanized locker baskets. The white baskets are where we keep some of the toys that the little guy plays with while I’m working. 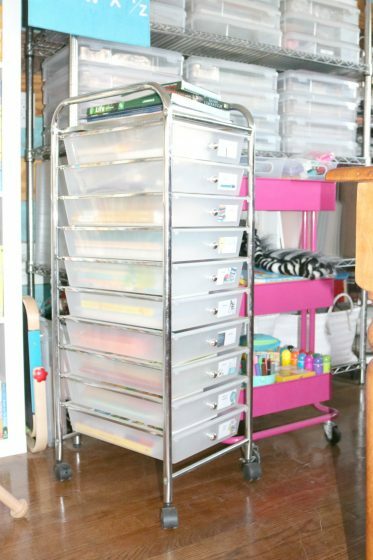 Not surprisingly, we have the same clear rolling cart that just about every homeschool family in America has. We use it for all of our current curriculum. The pink cart (this one’s from Michael’s) is lots of fun stuff that we use for Pre-K with the little guy. 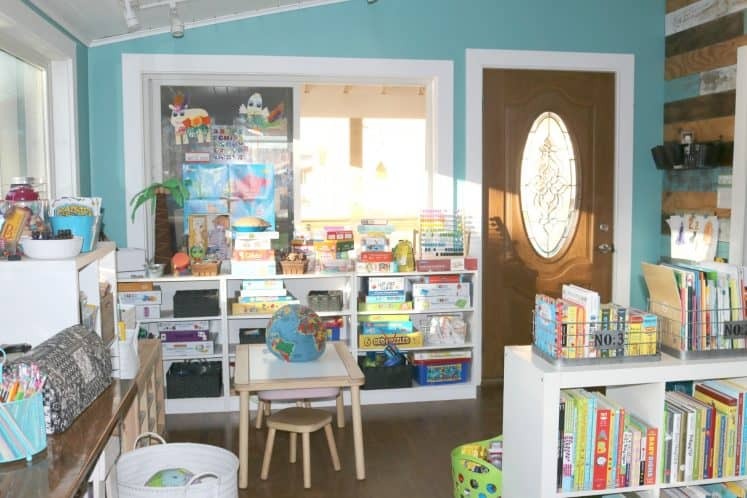 I know that I’ve shared our homeschool library before. These two shelves are where we keep all of the little guy’s books. 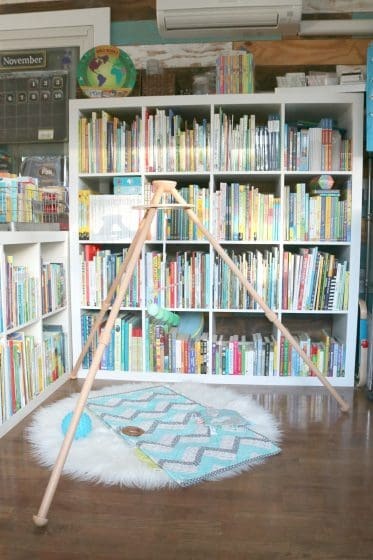 For the time-being, baby girl’s Montessori play space is in this corner too. I’m seriously in love with these mobiles. In a few months, she’ll be finished with the visual mobile progression and we’ll put them away. In the meantime, this gives her something to do while I’m working. Our books are mostly organized by series. Beyond that, they’re kinda random. I do try to keep the books for our literature-based curriculum together, though. 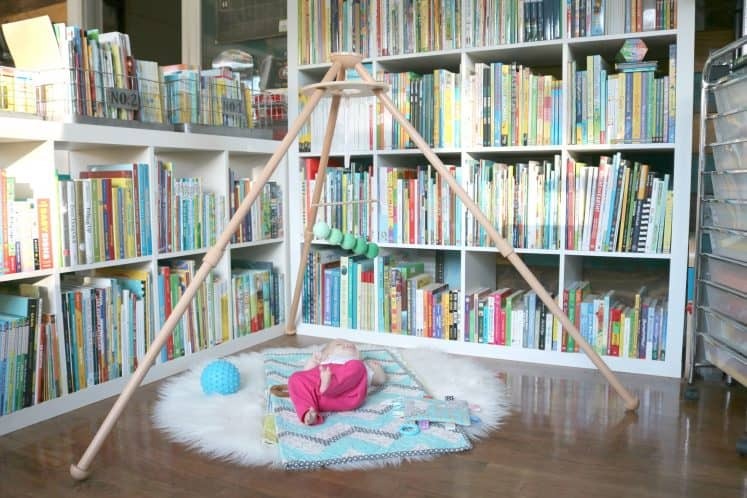 We love to read, so obviously we have lots of books. 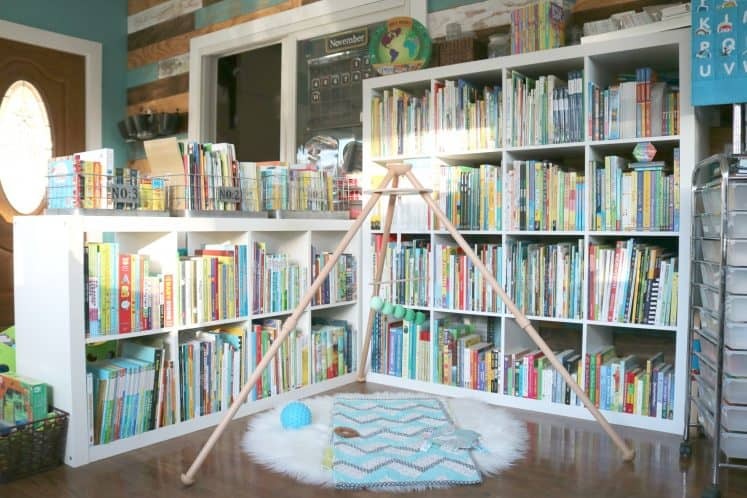 When my husband finishes the living room, we’re planning on building bookshelves along one entire wall. I seriously can’t wait to have all of our books in one place. 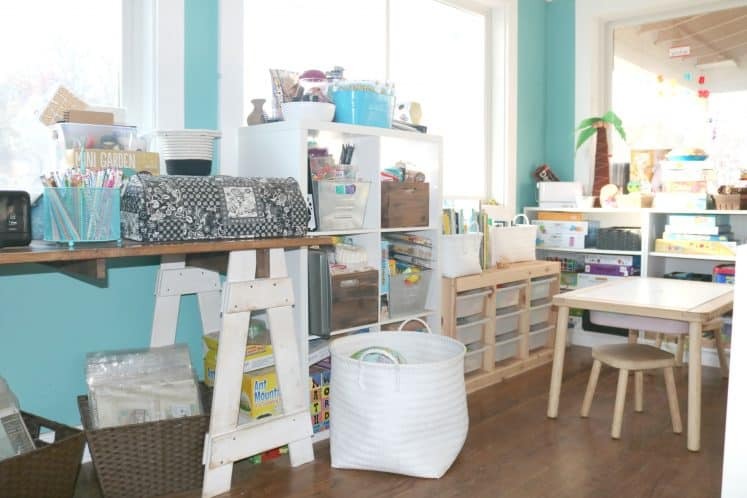 The little guy’s kitchen is in here and we have all of our kids’ art supplies + sensory materials organized on two of these white cube shelves. Here’s a look at my desk with my laptop and printer along with lots of tools and this cool wire organizer that we found at Target a few months ago. In other news, the little guy has sort of taken over this side of the studio. 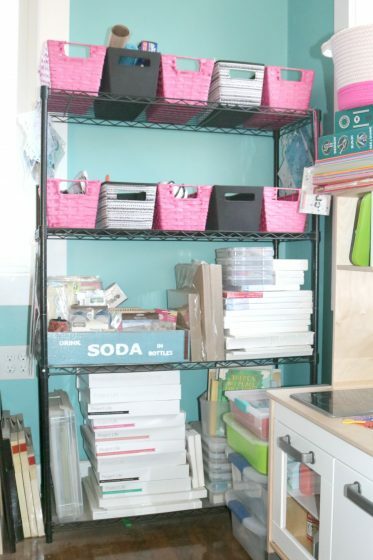 This is the other white cube shelf that I mentioned and it’s of course where we keep most of our kids’ craft supplies. If you look closely, you’ll also see more sensory materials. This is of course his workspace. We use the Ikea Flisat Children’s Table as a sensory table, so the bins are always filled with something. 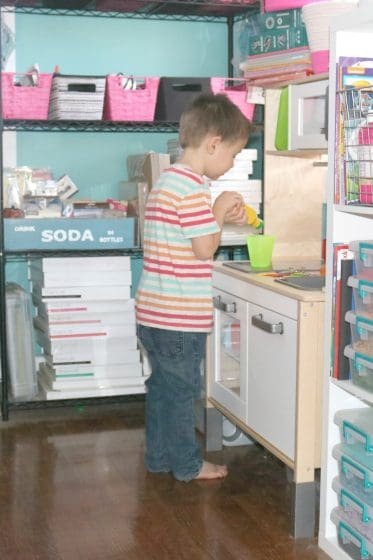 We use the Ikea Trofast to organize all of our STEM toys – K’nex, Smarty Parts, etc. This is the Ikea Duktig Play Kitchen. I’m not even exaggerating when I say this thing gets played with every day. It was definitely money well spent. And of course we can’t forget about the little guy pouring himself some juice. The studio is definitely all kinds of awesome, don’t ya think? I can’t wait to see how it evolves over the course of the next year.